This modern, semi-detached cottage in Mickleton near Middleton-in-Teesdales sleeps eight people in four bedrooms, one king-size double with en-suite shower, basin and wc, and three twins(two zip/link, can be super king-size double on request). 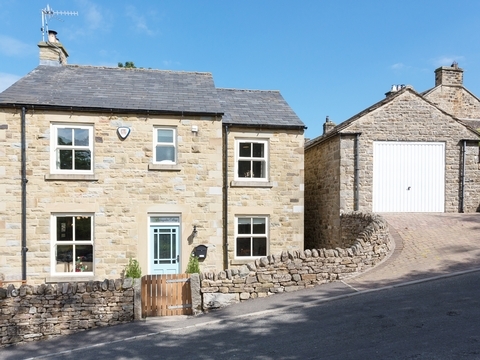 1 Springwater View is a contemporary, semi-detached cottage set on the outskirts of Mickleton near Middleton-in-Teesdale, North Yorkshire. With four bedrooms including two super king-size doubles, which can be converted into twins on request, plus a king-size double with en-suite shower room and one twin, this cottage can sleep up to eight people. There's also a bathroom and a ground floor cloakroom along with a well-equipped fitted kitchen with dining area and a comfortable sitting room with a woodburner. Outside, there is off road parking for three cars plus an enclosed courtyard garden with lawns and furniture. 1 Springwater View offers friends and families a wonderful base from which to discover the many delights of this beautiful area. The small hamlet of Mickleton is situated in the heart of beautiful Teesdale, close to the villages of Romaldkirk and Middleton in Teesdale and within a few miles of the market town of Barnard Castle. Contact 1 Springwater View Self Catering Cottage Mickleton County Durham > for Enquiries and Availability.